Photo from the Standards Committee Meeting. Left: M Sanders Independent member. Middle: Head of Legal Quentin Baker. Right: Chair Mr D Boreham. On the 1st of November 2011 I observed a Cambridgeshire County Council standards committee meeting at which the committee refused to retrospectively approve the appointment of an independent renumeration panel which had been selected by the chief executive without their involvement. The panel came up with recommendations for a 25% rise in councillors’ basic allowances, as well as higher payments for cabinet members and the council leader. I wrote an article about the full council meeting at which those recommendations were endorsed by a slim majority of councillors. The council’s constitution requires the standards committee to appoint the independent renumeration panel, its refusal to agree retrospectively to do so means the council decision will be declared void. The council’s head of legal will report to the next full council telling members their vote to hike their allowances was unconstitutional and therefore not valid. The council is required by law to have an independent renumeration panel, which must make a recommendation to full council. This process will now have to be re-started. The standards committee will presumably have to meet again to decide how to recruit members of the new panel. The meeting was held in a small committee room. The standards committee is made up of three independent members, on of whom serves as chair, and five councillors. The independent members are Mr D Boreham (Chair), K Gaseltine, and M Sanders. Cllr members are Cllr Carter (Labour), Cllr Heathcock (Liberal Democrat), Cllrs Lucas, Powley and Reynolds (Conservatives). After I entered, before the meeting started, I asked if there was to be a public speaking slot. I asked as I had seen @ClareBlair tweet saying she had been given permission to speak at the meeting, yet there was no public speaking slot on the agenda and I was wondering what was going on. The chair, Mr Boreham, responded evasively to say that it was a public meeting. I explained to him there was a difference between a meeting at which the public were able to speak and a meeting merely open for the public to observe. Mr Boreham suggested in a very vague manner that there would be an opportunity for members of the public to have a say. The meeting started with declarations of interest. All members had an interest to declare as both the independent members and the councillors get allowances. Mr Boreham invited the council’s head of legal, Quentin Baker, to introduce the report on how the panel had been appointed. Mr Baker admitted his report wasn’t very good in terms of explaining the background of those appointed to the panel; he said he’d got the information on who they were from googling and said he wasn’t very good at googling. A heckle from the public seating (from a Liberal Democrat councillor I think) pointed out he had omitted to mention one of the panel members was a member of Cambridgeshire Fire Authority. Mr Baker said he had been unable to get a meeting with the council’s head of democratic and members’ services, so he had not had any help from them in preparing his report. Mr Baker explained how the chief executive had appointed the independent renumeration panel, without any rigorous process, he said there were no CVs or application forms. 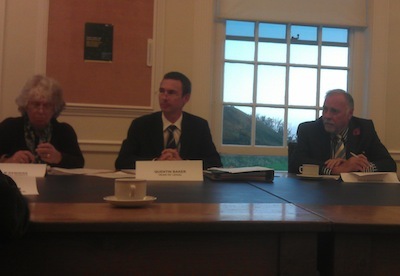 The Chief Executive was not present at the meeting despite Quentin Baker firmly placing the blame for the failings with him. An attempt was made by the Head of Democratic & Members’ Services to seek the views of the Standards Committee members via email. However, no responses to the email were received. All members of the committee, both councillor members and independent members, including the chair, said they had not received that email. K Gaseltine said the first she heard of the appointment of the panel was when she had read about it in the press. The email which was claimed to have been sent was published as an appendix to the report, though without its full headers or a full recipient list. Mr Baker finished by admitting the process for appointing the panel was flawed but asking the committee to ratify it retrospectively regardless. The chair allowed independent member K Gaseltine to speak first, explaining she had said she wouldn’t be able to stay for the whole meeting due to her health. K Gaseltine condemmed the process that she hadn’t been aware of. She described it as “illicit” and also complained that all but one of the appointees were part of the public sector. Member of the public Clare Blair spoke next. She said she had been invited to speak by the committee, but the chair didn’t appear to know who she was. Clare Blair said she was an “ex-member” without clarifying which authority she was referring to (I don’t think she’s been a county councillor?). She made a series of complaints about the process, including claiming the chair of the independent panel had been paid £5,000 to sit on it. Blair said that county council officers had overridden the process for appointing the panel’s chair, and also said the guidance provided to the committee by the legal officer in an appendix to his report was out of date. Another member of the public heckled, seeking to speak, but the chair of the meeting Mr Boreham refused. I heckled to point out that the person heckling was Cllr Killian Bourke the leader of the Liberal Democrat opposition on the County Council. Mr Boreman thanked me for my intervention. There were calls from the committee to summon the Chief Executive. Mr Boreman became confused between the Chief Executive and the leader of the council and didn’t appear aware they were different roles held by different people. After this had been explained to him a council officer was sent to investigate the availability of the Chief Executive. Some debate among the panel continued with Cllr Lucas calling the process fundamentally flawed. The chair then asked if any other members of the public wanted to speak. I took the opportunity to make the point that if there was to be a public speaking slot then it ought to have been on the agenda and advertised in advance. I questioned how Clare Blair had obtained her invitation to speak given the chair’s claim not to know who she was, and asked if the councillors present in the public seating had been made aware what if any speaking rights they would be accorded in advance of the meeting. I said the meeting was a process farce investigating a process farce. I noted the significant public interest in the councillor allowances rise and suggested had the public speaking slot been advertised there might have been many members of the public seeking to speak. I also used my opportunity to address the committee to express my view that the panel was full of people with a conflict of interest as they all had other public sector roles from which they were able to draw expenses and allowances, they had an interest in maintaining and extending the current culture. Mr Boreman again struggled with the difference between a meeting open to the public and one at which the public were merely allowed to observe. He said the Standards Committee never has a public speaking slot on its agenda. Cllr Bourke was then allowed to speak. Despite my earlier intervention, independent member M Saunders said she didn’t know who he was and asked him to introduce himself. Cllr Bourke said he had never agreed to an urgent review of councillor expenses and the report to the meeting was wrong on that count. Cllr Bourke said that the leader of the council, Cllr Nick Clarke had put undue pressure on officers to hold an urgent review. The committee held further deliberations. Cllr K Reynolds said the Chief Executive could be trusted, he appeared to be suggesting this meant everything was fine. One good thing the chair did was go round the table requiring each member of the committee to express their views; this resulted in the usually silent Cllr Carter even saying something. She agreed the process was flawed. A vote was held and those members of the committee present unanimously voted to reject the recommendation to retrospectively approve the appointment of the independent remuneration panel, making clear their view the process was seriously flawed. The meeting’s chair was careful to note it was the process which was being deemed flawed and they were not making any particular criticism of the individual members of the panel who had been appointed. Speaking to Clare Blair after the standards committee meeting the council’s head of legal said a report would be prepared responding to the standards committee’s decision which would result in a report from the monitoring officer under section 5 (of the Local Government and Housing Act 1989) to the next meeting of the full council letting members know their decision to support the recommendations of the independent panel had followed a flawed process. This entry was tagged Cambridgeshire, Public Money. on November 3, 2011 by Richard Taylor. A Section 5 report is required when an unlawful decision was made or a decision likely to cause a breach of the law. So the proposed scheme wasn’t just ‘flawed’, it was against the law. Why the solicitors in the Council required a body responsible for the behaviour of councillors to let them know the legal position is beyond me. Someone could make a FOI request to the council to try and find out what went wrong with the failed email to the committee members and why the person who supposedly sent it refused to meet with the head of legal. 2. 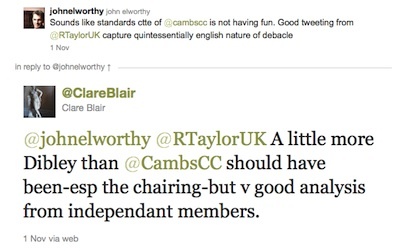 In relation to the “To” line : ‘Standards Committee Members’, details of what that is referring to, eg. if it was an alias for a list of email addresses, release those email addresses, if it is a display name for an email address or a series of addresses, release those. 3. Any emails, or record of correspondence, from August – November 2011, between the Head of Legal and the Head of Democratic and Members’ Services on the subject of arranging a meeting to discuss the process by which the independent remuneration panel was appointed. and post the link the comments here. I’m not sure it will really achieve anything, other than of course answer some questions raised. I think we need to look forward to the next panel and keep an eye out for any new appointments process proposed. My understanding is the head of legal must have thought if the standards committee did retrospectively approve the panel appointment everything would be OK. I can’t understand how the Head of Legal thought that the Standards Committee could change the legal status of the decision unless it was that the cttee could say that they had somehow forgotten to covene the IRP but that’s very shaky ground. It still doesn’t cover the very dodgy procurement of the chair of the ‘wrong’ IRP. I wonder how the Chief Exec of Northamptonshire County Council feels about this. He is, after all, in charge of the legal services provided to Cambridgeshire. Please consider saying where you are from eg. "Cambridge". Embedded Tweets, YouTube videos, Google analytics etc. may set cookies, as may commenting.